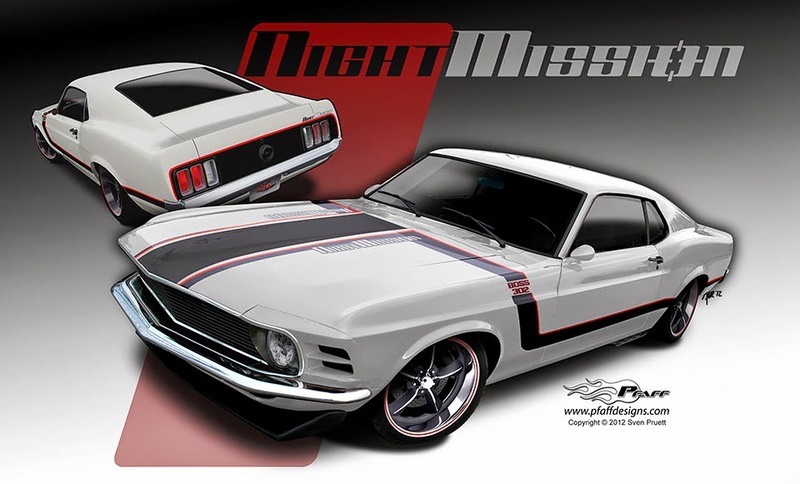 Night Mission Boss 302 Blog: Rear Bumper Scanning, Door Gapping, Harley Headlight Install, Etc. 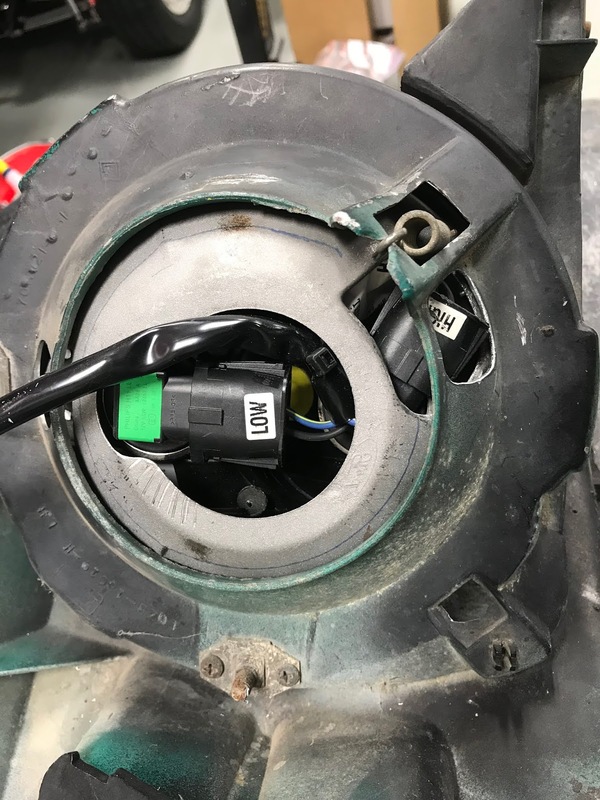 Rear Bumper Scanning, Door Gapping, Harley Headlight Install, Etc. It’s been another good while since my last update but we have definitely been busy with several different projects going on all at once (almost). 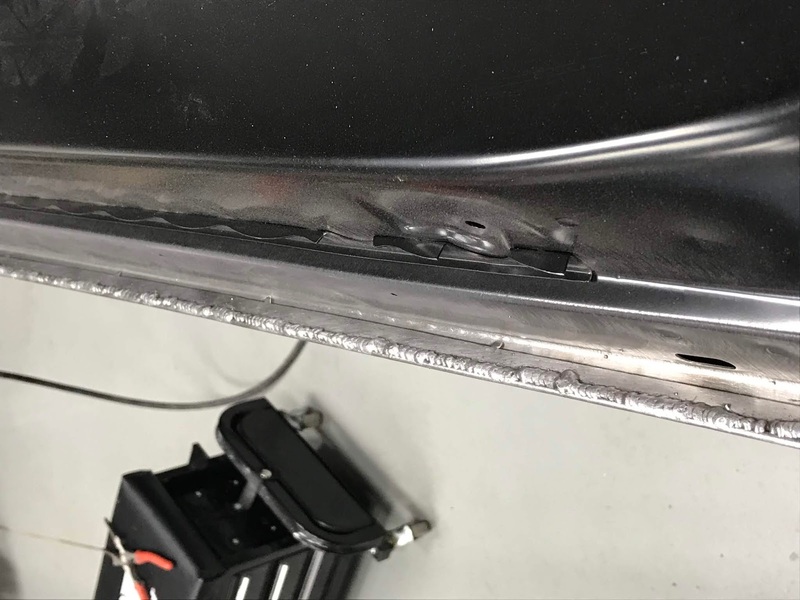 While the rear bumper project remains the dominant work in the shop, the latest work on that particular project has allowed windows of “sown time” that enabled a fair amount of other work to progress. So this update will be covering a lot of very different details but exciting stuff nonetheless! Here we go! 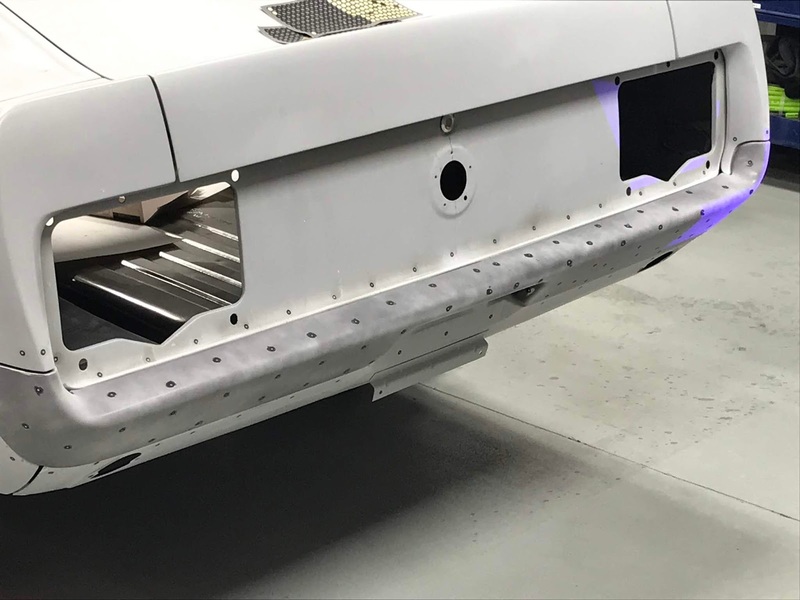 As the rear bumper project continues, I have been able to ponder what to do with all of the “master” parts that were created to produce the composite bumper. The life span of a master buck and mold is rather finite and the thought of losing these details started to really bother me. Also, I have considered that I may find myself needing to produce another example, but custom fit to a totally different car for example. 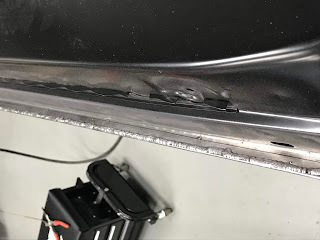 In consideration of this and the fact that these cars vary rather considerably in build tolerance, I needed to have a way to custom tailor a bumper to another car’s exact dimensions to ensure it fit that car as well as it does mine. Also, I have fielded a number of inquiries on producing this bumper in a format that would allow it to be fully chromed to render a more “factory” look than the painted version I needed. So, with all of these considerations on my mind, I decided to seek out a local resource to digitally scan the surfaces at very high accuracy to preserve the shape indefinitely as well as provide a model that could be easily manipulated in almost any modern CAD/CAM design software and reproduced in any volume desired on modern CNC machining centers. 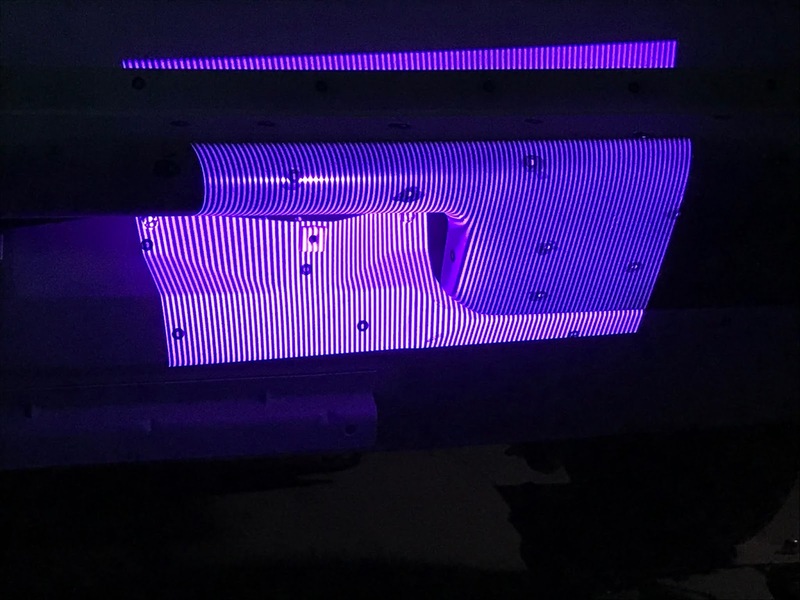 Digital 3D surface scanning is not especially new, but the technology has become infinitely more accessible to this type of market than ever before. However, the market still varies by an enormous degree as to what is necessary and appropriate to a project like this versus complete overkill. Price, of course, varies equally wide and suffice it to say that most “commercial” scanning providers that offer mobile services are rather exorbitant in cost in most cases. And generally speaking, they don’t especially cater to one-off “small” jobs like this either. So, after much thought, I decided to try to find a fellow enthusiast that was as excited about 3D scanning as I am about car building, and who wasn’t tied to the “Big 3” local mentality and commensurate cost as the “commercial” providers are. I set off by shaking the vines on of the local “hot rodder jungle telegraph” and after a few weeks, I was put into contact with a very local young gentleman who is “our” kind of people. He is as much an enthusiast in 3D scanning as I am about this project and we seem to see eye-to-eye on many things. After a very energetic conversation, it wasn’t long before we had come to terms with the project scope and he was in the shop with his scanning equipment and the process of digitally “documenting” the rear bumper buck in position on the body was begun. 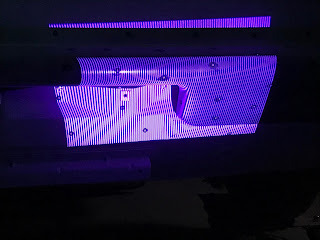 The process is called “structured light scanning” or “blue-light scanning” and involves a projected series of light patterns applied to a targeted surface and recorded by two different precision color cameras at different incidence angles. The images spliced together and analyzed in a sophisticated software suite that is able to very accurately reproduce the surface contours in 3D space. In our case, the surface was accurate to 50 microns (0.002”) without a single contact made to the surface! That’ll work just dandy! 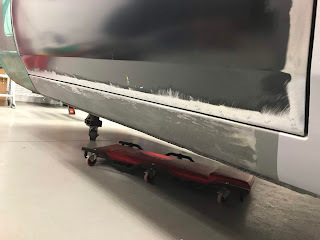 In just a few hours, the entire surface of the bumper buck and surrounding body work was digitally rendered in 3D space and ready to pull into the design software to smooth and correct any imperfections and prepare the “shell” for the rest of the scanned data to be paired. The next step will be to remove the bumper buck from the body and scan the underlying sheet metal to accurately generate the critical surface and edge details of the body as well as the mounting locations so all of this information can be combined into a single rendered shape that can be reproduced as many times as desired with incredible precision and in almost any medium we choose. And while I’m not yet prepared to endure the expense of whittling a 510-pound piece of billet aluminum into a 15-pound bumper (yep…..no kidding! ), we could at any time do so with the data this technology has enabled us to gather. Cool stuff! More to come! 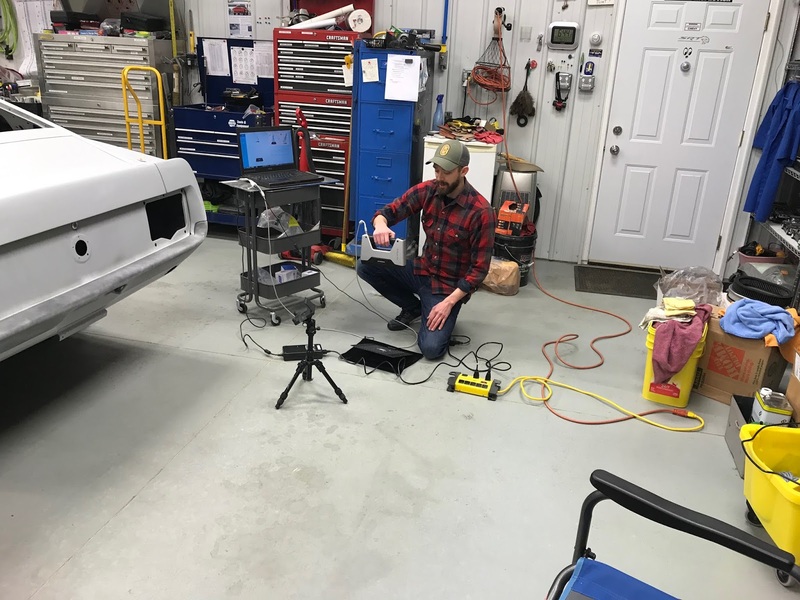 Here, Alex is calibrating the 3D scanning head in preparation to scan the bumper buck mounted on the car. 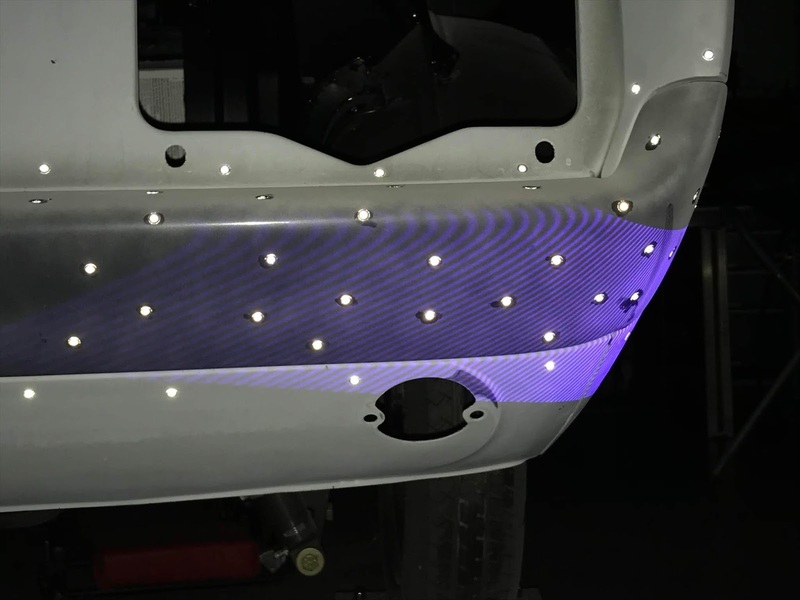 The bumper buck get an interesting combination of reflective "targets" applied to the surface and a coating that eliminates the reflective surface of the polished buck. The targets allow the scanning software to accurately overlay the various scanned "snapshots" into a single continuous image. The dulling spray (actually cheap dry shampoo spray!) kills any reflection off the scanned surfaces and allows the structured light pattern to cast cleanly over the surface without distortion caused by reflections. I snagged this shot while the light pattern was cast on the corner. The camera flash really lit up the targets and made for a pretty interesting shot. Structured light patterns are designed to show deformations in the line shape very accurately. These deformations are analyzed by the scanning software and are displayed as an accurate copy of the shape. Essentially, if the surface bends, the structured light lines bend in direct proportion to the surface curvature. Pretty cool tech! This is essentially the first surface Alex produces from the scanned data. It's pretty exciting to see hundreds of hours of handmade work preserved on the screen in all its digital glory like this (and it's not even done yet)! Pretty proud of this shot! Total surface deviations are exceptionally small based on this image and any clean-up required will be very minor. The scanning accuracy using the reflective target method is 50um (0.002")! Plenty good for this kind of work for sure! In the opportunities to return to some “normal” shop work, we were able to pick back up with the final stages of gapping the reproduction doors to the body. With both ends of each door already gapped to the factory production original fenders and the b-pillar post edges, the only remaining gaps to tweak were the lower door edges as they meet the rocker sills. These gaps were notoriously wide in production Mustangs to accommodate the rather wide tolerances in fit of an assembly line vehicle. To the casual observer, the lower door edge is the least likely to show a gap mismatch than either end gap, so the factory naturally gave itself the most leeway there to fit doors into often irregular openings. Unfortunately, to a builder, the lower door edge must fit just as well as all of the other gaps and this often calls for an extensive amount of material addition and massaging to get the sill gaps tightened up and looking good and this project was no exception. In the case of this particular door pair, both sill gaps were rather wide and allowed for the entire bottom edge to have a 1/8” welding rod to be welded the full length of the door to fill in the sill gap as much as possible. We are shooting for a target gap of 3/16” (4.8mm) along the sill which is very slightly larger than the end gaps. 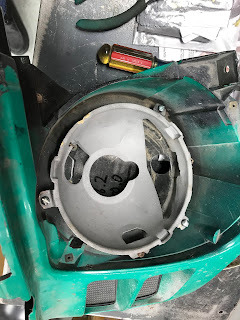 This allows for a small margin of safety when the doors are finally hung and all other play in the hinges is accounted for in “real world” operation. The difference is imperceptible to the eye but allows just enough cushion to help avoid damage to the painted sills and door bottom edges. As work continues, the driver door will get final sill gapping completed and then work will move to the passenger door for the same treatment. Once the doors are fitted, we will be coming to the end of the “major” metal work on the body and we can start to concentrate on the sheet metal forward of the firewall. Fortunately, with the exception of the front lower valence and stone guard, the entire nose of the car is factory original metal. Here's a little shop secret: For doing certain types of body sheet metal welding with a MIG, I cut the gas collar back to expose about 3/16 to 1/4" of the MIG tip. 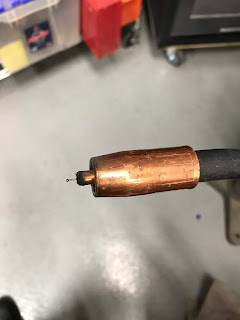 This creates a more gentle plume of shielding gas around the weld and allows you to see and maintain the perfect wire stick-out for this kind of work. 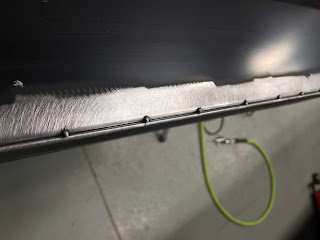 It works best to run the heat and wire speed slightly on the higher side for the material thickness you are welding and make sure you are welding in absolutely still air. No breeze, no open shop doors, no A/C or heat blowing over your work area. Lower door edge receives a stick of 1/8" mild steel welding rod tacked along the entire bottom edge of the door. 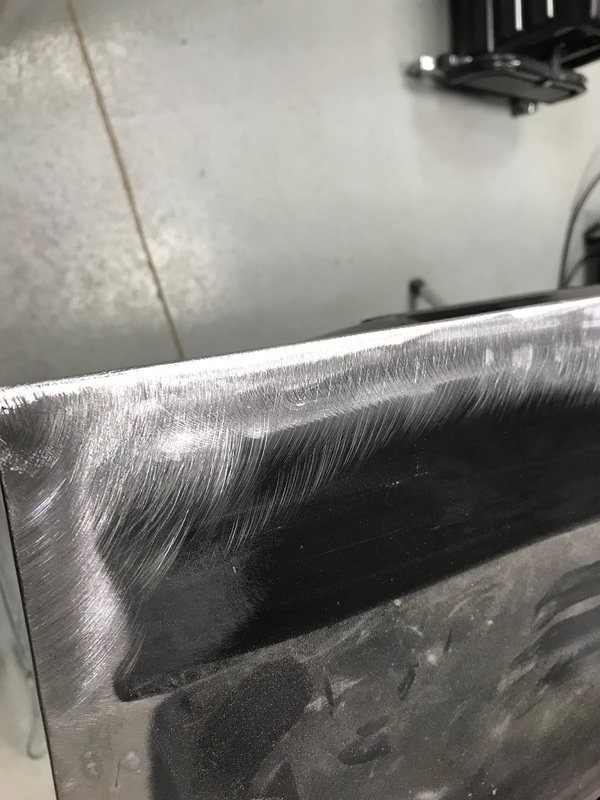 In this case, this allowed for about .040-.060" of working stock along the entire lower edge. 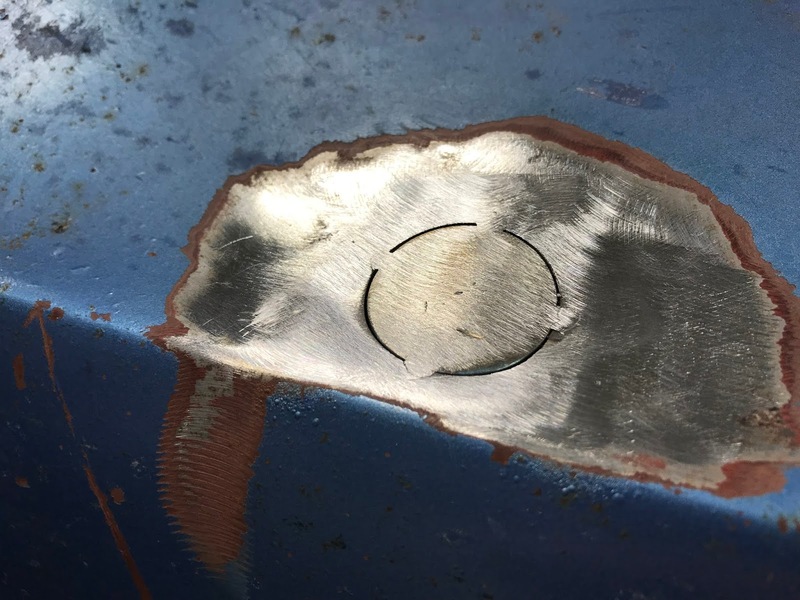 With no gap to the original door edge, the welding rod is welded fully along the inside and outside edge of the door. 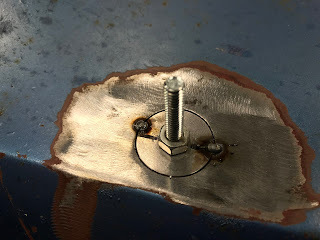 Note how clean and tight the weld bead is using the aforementioned MIG torch modifications and settings. 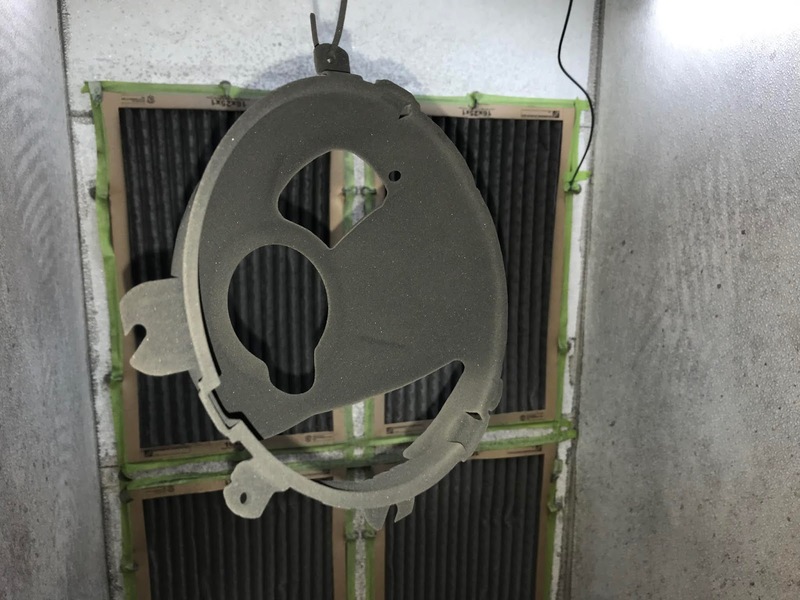 Weld seams are finished with a 36 grit Roloc disc and the door is ready to bolt back on the car to begin the gap refinement by hand. Target is 3/16" gap along the entire lower sill edge. Here you can see how tight the lower gap has become with the addition of the welding wire along the lower edge. With a little precision hand shaping, the door sill gap will be a perfect 3/16" in short order. Some keen followers of this blog have inquired as to what headlight combination is shown in the designer rendering of the car on the title page. I have played that a bit close to my chest all this time, mainly because I had not fully worked out how to make the conversion a reality. Well, after untold hours noodling it all out, I am very happy to show the new headlight combo that matches the rendering exactly. This tricky little setup involves installing a modified pair of Harley Davidson dual-beam headlight assemblies into a heavily modified set of factory headlight buckets and modified fender extensions. 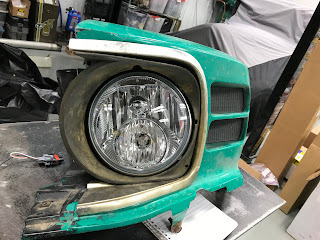 The end result is a very tidy and effective modern headlight installation that is slightly “edgy” in style but doesn’t take away from the “production” look of an original glass headlight without the nasty appearance of LED bulbs that look “too modern” and out of place on a vintage Mustang (IMO anyway). The end result of the conversion allows the factory retaining rings and adjusters to remain intact and fully functional with the convenience and infinitely better lighting quality of a modern quartet of halogen “twist-lock” style bulbs. And being motorcycle derived, the light dispersion will be much broader than conventional auto headlights which are a very welcome upgrade for older eyes like mine. This might not be particularly welcome to oncoming traffic, but it has the side benefit of being a guaranteed “win” if anyone decides to try a “high-beam showdown”. Another unusual modification I am particularly proud of is the installation of Harley Davidson "dual beam" halogen headlights. This is a concept proposed by our designer that I fell in love with. Here, you can see SOME of the modifications made to the factory headlight buckets as part of this conversion. Fully mocked up, you can see how very tight this adaptation is. However, the end result is a system that uses ALL of the factory retention and adjustment hardware. A quick trip through our powder coating booth for each bucket and the conversion was complete! I really love the look that this headlight conversion makes! I threw some old trim pieces in the fender extension with the headlight mounted up to show the idea. I think it perfectly matches the theme of the car in every way! The final quick update was to fill the radio antenna hole in the right fender. This car will not have a radio installed (at least not one with a visible antenna anyway! ), so the need for a heinous looking, fender mounted “flag pole” of an antenna is non-existent. With that, a simple disc of sheet metal was created and given appropriate contour to match the fender shape surrounding the hole and welded into place. Nothing fancy required! With that, we are off to finish up the rear bumper/bodywork scanning and finishing up the door fitting. Once that is done, we will look to get the doors stripped and in primer, the rocker panels cleaned up and straightened and start work on the cowl panel mounting modifications. Should be a busy Spring! Factory antenna hole just couldn't stay. I made a filler piece on my lathe then formed the curvature to match the fender contour. I used a 1/4" bolt to hold the plug in just the right spot while I tacked it in as ween here. Here, the tacks are completed and ground smooth before welding the entire plug in place. No idea why I didn't take more pictures of the process, but that's all I've got! The headlight is a pièce de résistance touch. Kudos for that bit of 'brilliance' :) Forward!!! Man, many thanks RJ! Given that this is likely the slowest build in the history of man, I am at least happy that the "details" are appreciated! Forward indeed! Sven W. Pruett 2010-2018. Simple theme. Powered by Blogger.